India is witnessing “Yi Nao” phenomenon which is common in China. The literal meaning of “Yi Nao” is healthcare disturbance. More precisely related to violence against doctors. It is a type of violence in hospitals to get repayment for real or apparent medical negligence from the hospital authority. This phenomenon includes assault to the hospital personnel, damage health facilities, and equipment ultimately resulted in normal hospital functioning. According to a study in China in 2006, of 270 tertiary hospitals, 73% reported the Yi Nao phenomenon. In India, there was a time when Indian doctors were bestowed upon divine status. Doctors, in India, were treated as gods and attracted vast respect without people actually questioning their treatment. They blindly trusted with the lives of their dear and near ones. However, now, the scenario has changed. The practice of nonviolence of Mahatma Gandhi inspired millions during the preindependence era. However, the forces of increasing economic aspirations, stress levels, frustration due to urbanization, high levels of competition, distorted and disturbed religious, and cultural values are adding to the intolerance among the masses. This has also led to the sense of distrust toward the medical fraternity. An Indian study suggests that nearly 75% of medical personnel have faced any workplace violence. This study concluded that the 50% violent incident took place in the Intensive Care Unit of hospitals, and in 70% of cases, the relatives of the patients were actively involved. Violence is an outburst of anger mixed with the frustration among the relatives of the people. Whenever we face the demise of any of our dear and near one, we go through phasic alterations in our mind and pass through five main stages of grief, denial, anger, bargaining, depression, and finally acceptance. People exhibit the displacement of anger and denial to cope with the situation, and it is the emotion transfer from a situation or person to another that is the main reason for violence against doctors and other health staff. Advanced medical care technology has revolutionized medical care outcomes on the one hand; however, it has led to high expectations for 100% cure among patients and relatives. The difference between these high expectations and actual ground realities is the main root cause of this curse. Other incidents, including blaming the doctor even when the relatives, have brought the patient at the end stage of the disease, to avoid paying hefty medical bills. Further, contributing factor for increasing violence is the poor image of medical professionals projected by media leading to the general belief around that healthcare delivery has become a business, and the patients are sort of consumers and are basically for extorting money. Corporate hospitals try to negotiate with the patient parties outside the institution of law to retain their social status. A literature search shows workplace violence as a result of doctor–patient mistrust, changing dynamics of the doctor–patient relationship although the other factors cannot be ignored. Ancient Egypt (approximately 4000–1000 B.C) – Edelstein et al. (1937) described the physician–patient relationship evolved from the priest-supplicant association. The paternalistic approach was in vague. At that time, healers used to play the dual role of magicians as well as priests to dominate the helpless, sick, and moribund people and their near ones. Egyptian medicine was based on paternalistic type or activity and passivity type relationship between the doctors and patients. Then, the doctors directed and patients obeyed orders without any queries or doubts. Medieval Europe and the Inquisition (1200–1600 A.D.) – After the death of Roman empire, the religious and supernatural world beliefs were restored. After the crusades and witch hunt, the doctor–patient relationship was destroyed. Again, the doctor regained the father such as figure; similar to the Egyptian era, where the doctor dictated, and the patient obeyed. Modern era (1700 onwards) – In the early 1700 s, there were very few doctors and they dealt with only upper-class patients. This model was called “symptom-based model of illness,” and the doctor played a dominant role. In the late 18th century with the rapid development of science, especially progresses in microbiological and surgical skills, “biomedical model of illness” emerged and it superseded the “symptom-based model of illness.” In this century, the paternalistic model was persisted. With the emergence of psychosocial theories (Breuer and Freud) in 1955, the mutual participation relationship were restored. The practice of medicine was renamed as patient-centered medicine. Michael Blaint, in 1964, proposed the idea of “doctor as a drug.” It was based on the dynamic relationship between the doctor and the patient. According to him, the doctor–patient relationship is a “mutual investment.” He believed that by the time the doctor obtained the patient's details, it permitted the clinician to improve his communication skills with his patients. It resulted in efficient consultation, which eventually provided a better understanding of the patient's requirements. That was missing in the previous era. From the above discussion, we can conclude that the doctor–patient relationship goes through ups and downs. Sometimes society sketched them as a god, sometimes as evil according to the changing scenario., It is a macro/generic description of the doctor–patient relationship. The change in dynamics described in era wise may be seen in a single lifetime of a doctor [Table 1]. The same doctor can behave differently when the situation changes. As an example, a doctor may engage in a parent–infant relationship when the patient is poor and illiterate. At that time, he thinks he is more powerful than the patient he will dominate. As it is seen in earlier times (Ancient Egypt model 4000–1000 BC), this kind of relationship is predecided by the doctor. The same parent–infant relationship also gets developed in the cases of emergency; however, at this time, it is by default not by choice of the doctor. Here, the power relation naturally shifts to the doctors' side. The same doctor can establish an adult–adolescent relationship in cases of acute nonfatal diseases (such as malaria and diarrhea.) with literate patients. Relationship of mutual participation is observed in chronic diseases. Here, the adult-adult transaction takes place. Interestingly, the inverse relationship between adolescent and adult is developed, when the patient is more powerful (by knowledge, money, and insured). In this relationship, the patient even dictates the doctor for his treatment. Usually, it is seen in less severe diseases such as minor acidity, leg cramp, or a headache. In corporate sector hospitals, adult–child relationship is established. It is seen, when an illiterate but poor patient visits a corporate hospital. In this case, the doctor does not want the dominant role in decision-making still patient rely on doctors. Again, the power shifts toward the doctor by default and not by choice. Patient's grievances – Unnecessary investigations, delay in attending to the patient, and request for advance payments or withholding a dead body after demise under a final settlement of billing. Doctor's grievances – There is commercialization of medical education with the rapid growth of private medical colleges with inadequate infrastructure, short of faculty staff as per the medical council of India (MCI) standards. Education in these private medical colleges is so expensive that most doctors then plan to get jobs in corporate sectors to get equal or more returns than the money that they have invested in their careers and corporate hospitals have a set protocol of how to proceed with a patient of the said disease. Due to all these factors, doctors are hesitant to take risky decisions which might have been better for the patient in the first place. Workplace factors – Workplace factors such as communication barriers, physical barriers, political pressure, the influence of relatives, and heavy workload adversely affect the relationship. Failure of the Government healthcare system: Factors, such as Government health policy, i.e., allocation of money on health, free medicines, and fixed timings of the outpatient department (OPD), are also an important determinant. For example, in a Government primary or secondary healthcare settings, the patients are being provided with free medicines. However, sometimes, due to inventory issues, the medicines could not be dispensed for a period, patients have the easiest access to the doctors to blame irrespective of the political interplay of factors. The public healthcare system in India follows the welfare model as the majority of people is poor and lack any health insurance. Due to subsidized medical care, Indian healthcare institutions (government run) are swamped with patients with their attendants. Some of the medical officers are looking after an average of 100 patients per day. It is obvious that quality of care will get compromised if the doctor has to see a 100 patients in a fixed period. This pressure cooker situation in the OPDs imparts a pseudoperception of negligence to the patient and his relatives, which leave them unsatisfied as doctor–patient interaction time reduces. Due to long waiting time in queues, inappropriate interaction or delay in attending patient triggers anger. As most of the patients are uninsured, sometimes diagnosis comes as a bolt from the blue for them and this economic disaster pushes them into emotional mayhem. Doctor–patient or Google patient relationship: Disease-related information accessed through the internet is often free, yet it is dubious. It provides quick access to the ordinary people for their health-related issues. It is supposed to empower the patient and facilitate the mutual relationship approach, i.e. adult–adult interaction. Relevant health-related information is available on social media groups such as WhatsApp and Facebook, nowadays. Patients and their family access the information and have a lot of opinions before consulting any doctor. This cannot be entirely attributed to the mistrust for the treating physician; however, they feel its better to have a beforehand idea about the symptoms so that they can go fully equipped with the medical knowledge and derive answers from the doctor. It can be encouraged by the doctors only if patients refer to authentic standard sites for information; however, in reality, mostly, the patients come up with a concoction of theories about their symptoms. This irritates the physician affecting doctor–patient relationship. Doctors are no more considered demigods or authorities in their field; on the one hand, where there is a valid reason for it because of the dilution in the field; however, on the other hand, the distrust is getting generalized to the whole community of physicians. Medical decisions are being altered by Wikipedia references on the related disease, untrusting patient's caregivers, practicing defensive medicine to be on the safer side, and seeking jobs in corporate hospitals. People blame doctors without thinking why anything which has happened in the first place. Every alternate day, we find the news of patients relatives assaulting doctors, inflicts grievous injuries but then it's just a piece of news in the corner of the paper somewhere. It is high time someone takes the responsibility of saving the saviors. Solutions to reduce the incidents of violence against the doctors include improved trust between the patient and the doctor not to be isolated from various other socioeconomic problems plaguing the market-oriented society. Deteriorating doctor–patient relationship is the symptom of social degradation, increasing intolerance, and increasing distrust. 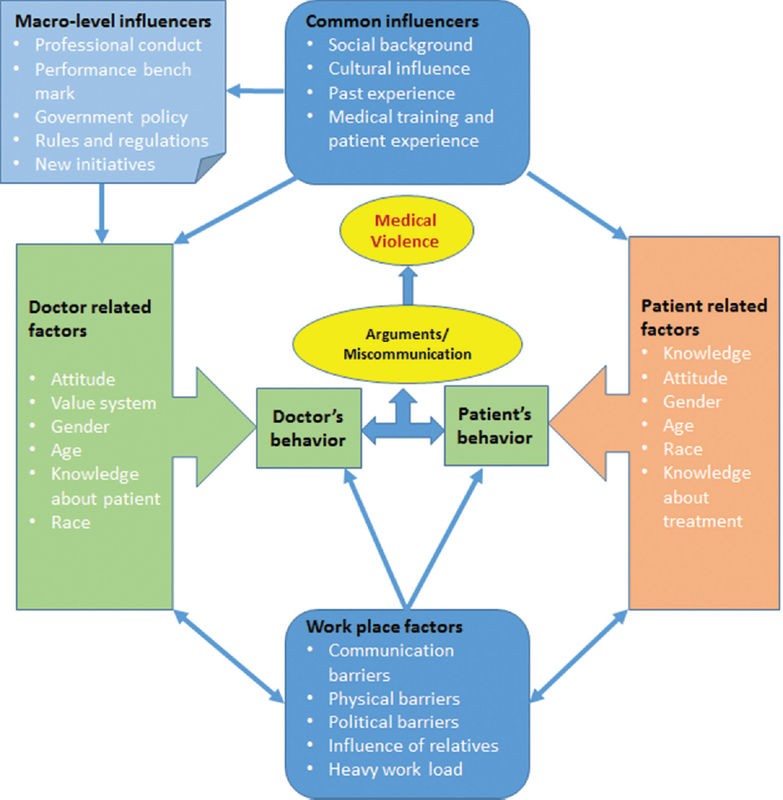 Hence, all these factors need to be addressed horizontally; medical education strengthening, filling crucial gaps in communication between doctors and patients, reducing the number of patients per doctor which is the root cause of the majority of problems as doctors are overworked, empathetic attitude toward patients, and tougher laws for both medical negligence and violence against doctors. The medical curriculum can definitely incorporate necessary communication skills. Media can play a role in improving the image of doctors and the medical profession projecting role models more than the negligence cases, so that young minds can replicate the ethical practices. Furthermore, violence against the doctors should be made a nonbailable offense so that the trust of physicians in the judicial system continues. Failure to acknowledge the altruism of the doctors will be the reason to discourage the next generation of brilliant students from taking up this unforgiving profession. We acknowledge Dr. Vijay Kumar Chattu for his valuable inputs in this manuscript. Pan Y, Hong Yang X, He JP, Gu YH, Zhan XL, Gu HF, et al. To be or not to be a doctor, that is the question: A review of serious incidents of violence against doctors in China from 2003-2013. J Public Health 2015;23:111-6. Ambesh P. Violence against doctors in the Indian subcontinent: A rising bane. Indian Heart J 2016;68:749-50. Morrison JL, Lantos JD, Levinson W. Aggression and violence directed toward physicians. J Gen Intern Med 1998;13:556-61. Kumar M, Verma M, Das T, Pardeshi G, Kishore J, Padmanandan A, et al. Astudy of workplace violence experienced by doctors and associated risk factors in a tertiary care hospital of South Delhi, India. J Clin Diagn Res 2016;10:LC06-10. 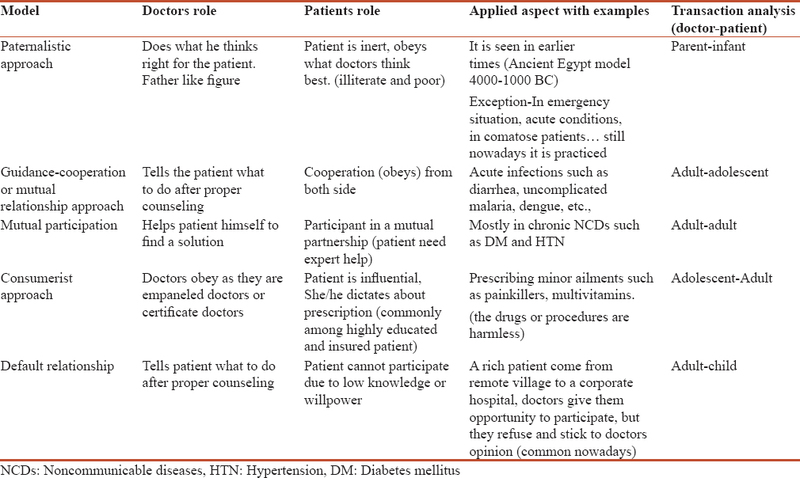 Kaba R, Sooriakumaran P. The evolution of the doctor-patient relationship. Int J Surg Lond Engl 2007;5:57-65. Lázaro J, Gracia D. The doctor-patient relationship in history. An Sist Sanit Navar 2006;29 Suppl 3:7-17. Banerjee A, Sanyal D. Dynamics of doctor-patient relationship: A cross-sectional study on concordance, trust, and patient enablement. J Family Community Med 2012;19:12-9. Armstrong S. Social networking for patients. BMJ 2016;354:i4201.